Whenever one thinks of New Zealand many things are more probable to come to one´s mind than hockey. But even in New Zealand, the land of rugby, racing and beer hockey, you can find the most exciting team-sport of the planet if you look hard enough. Hockey has been played in New Zealand for over 60 years and started in the South Island high country where farmers and farm workers played on frozen ponds and lakes. The first organised ice hockey tournament was played at Opawa, near Albury in South Canterbury in 1937 when Wyndham Barker gave a trophy called the Erewhon Cup. A meeting was held afterwards and the New Zealand Ice Skating Association formed. Ice hockey was always the poor relation in the NZISA (New Zealand Ice Skating Association) and it wasn't until 1986 when the New Zealand Ice Hockey Federation was formed at a meeting at Lake Tekapo that ice hockey began to flourish. New Zealand's international debut was at the IIHF D Pool World Championships in Perth, West Australia in 1987 where the team won the Bronze medal. New Zealand Senior teams have competed at World Championships regularly since 1995, but success has been elusive and the standard of competition very high. Junior teams began competing in the IIHF Asian/ Oceania Junior Championships in 1998. In 1999 a Bronze medal was achieved in Division 2 of these Championships, and in 2000 the New Zealand Juniors won the Gold Medal in Thailand. The New Zealand Ice Hockey Federation is a member of the IIHF (International Ice Hockey Federation) and gained access to international competitions such as the World Championchips by becoming a member. 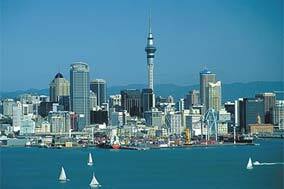 Auckland, the "City of Sails" with approximatly one boat for every four households, does not only have close to 1.000 restaurants, 60 hotels and almost that many art galleries, but also 7 hockey clubs that compete in the region. All of those seven clubs put teams on the ice in all age groups menitioned above in the general information about hockey in New Zealand; some teams such as the North Shore Vikings even field more than one team per age-group in the respective groups. But being a hockey-player or a hockey-addict is a tough "business" in Auckland as there are only a total of two ice-rinks in the area, ice-rinks that are off course not only used for hockey but also as venues for public-skating, figure-skating and anything else you can imagine on ice (well, maybe there isn´t a whole lot more but those activities are enough to give tons of headaches to those working out the schedules for the rinks). Both rinks in the Auckland area are owned by the Blong Family and are called Paradice - Avondale or Botany Downs. Depending on how much money you´re willing to transfer to the police you can travel between both arenas in about an hour by car. The rink in Botany Downs is the newer one of the two and built in 1999 to state of the art specifications. 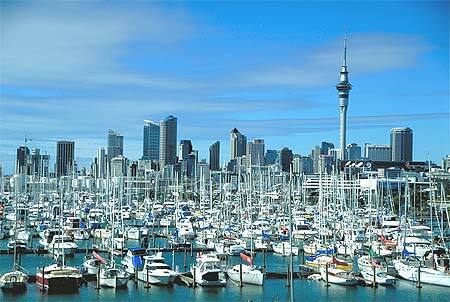 The rink itself is located in East Auckland, the fastest growing residential area in New Zealand. It is situated oppositve the largest shopping center in Auckland on 17 hectares (just opened in July 2001), which boasts 130 specialty shops, a 25-shop food court and a supermarket. The rink in Botany Downs also has a finess centre, you can find a bar at both rinks though. The rinks in Auckland are also one of the possible three sites for the annual national championchips besides Christchurch and Queenstown in two of the other three regions of New Zealand´s hockey association. Each year the competitions are held in a different venue in order to maintain a fair level of travelling-costs for all players participating in the national competitions, in 2001 Auckland´s teams won two gold (under 13 and under 19) and two silver medals on the national level. New Zealand´s junior teams are also starting to gain a positive reputation in the area. In 2000 the under-19-team won it´s first gold medal in Bangkong in the Oceania Games, prior to that another bronze medal was won at the North Korea Oceania Games. New Zealand was also chosen as the site for the International Ice Hockey Federation´s Under-18 competitions in 2002 which were held at the Botany Downs´ rink in Auckland. 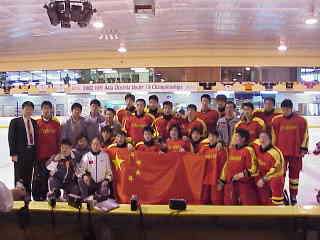 Teams from all over Asia travelled to the city of sails and China eventually won the gold medal. First of all it might be important to note that you shouldn´t expect anything close to what you´re used to of a hockey-experience when you´re travelling to Auckland or New Zealand from Europe or Northern America, nevertheless it might not be a total waste of time if you still happen to stop by any of the two rinks in the Auckland area. If you´re staying for a longer time you´re probably also more than welcome to skate with one of the local teams so there is no reason to miss hockey when you´re already missing ozon above your head all day. 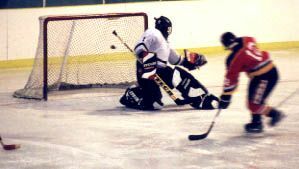 On some occasions over the course of each year teams from all over the world stop by in New Zealand to play some hockey games. In 2002 the Klagenfurt University Ice Hockey Team will tour through the country and also play twice in Auckland (once at each rink) and some years ago the world travelling Canadien Moose stopped by in Auckland and filled the rink to capacity with more than 500 people watching. The Mosse not only played in Auckland but also to Christchurch and Queenstown in order to promote the sport and an under-17-team from Kelowane (British Columbia, Canada) visits almost every year for some games and some better weather thank back home. The crowds you might find at games can´t compare with those of professional hockey teams anywhere else in the world as New Zealand´s local teams such as the North Shore Vikings in Auckland are not a professional team. What you can expect though is a little bit of family & friends and maybe some lost tourists, but that´s about it. Nobody gets paid for playing hockey (it´s the other way around...) and when you´re looking for a crowd with drums, flashing lights and stuff like that you will probably be disappointed. The North Shore Vikings for example last year rewarded their coaches by paying a token sum towards that Coaches own ice time account which averaged about $50 NZ per month but certainly did not cover petrol, mileage, inconvenience etc., the team also had to pay the referees for their game who took about 15 dollars per game so as one can easily see it´s about the love of the game in New Zealand and not about corporate hockey entertainment.